subtidal, Ría de Ferrol, Galicia, Spain, 2016, Ignacio Bárbara. 24 Dec 2016. Ignacio Bárbara. © Ignacio Bárbara (barbara@udc.es). South of Portugal, 2010. 09 Dec 2011. Ignacio Bárbara. © Ignacio Bárbara (barbara@udc.es). Published in: Ardissone, F. (1893). 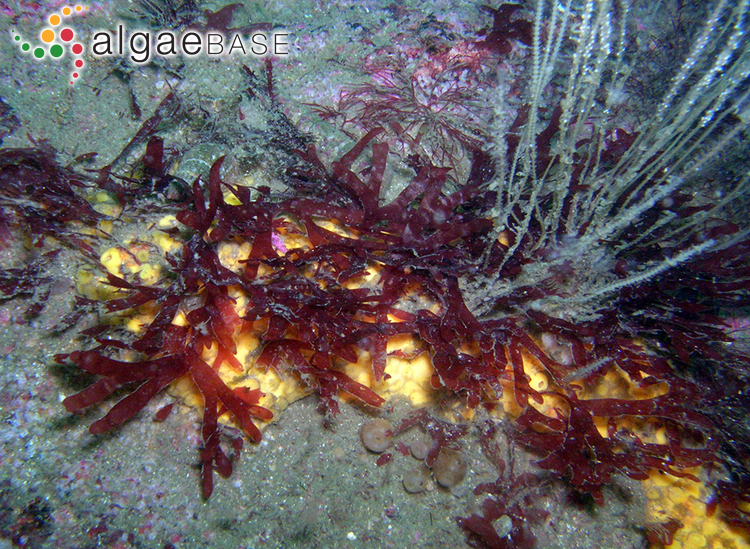 Note alla phycologia Mediterranea. Rendiconti Istituto Lombardo Accademia di Scienze e Lettere, Serie II 26(17): 674-690. Named for Edward Morell Holmes (1842-1930), British phycologist and collector. English: Holmes's Rose Weed (Bunker et al. 2010). Flattened, fan- or V-shaped, somewhat cartilaginous, brown-red fronds, to 100 mm high, with short stipes arising from a rhizoidal base. Fronds repeatedly dichotomously lobed, axils narrow, apices elongate sometimes forming tendril-like extensions, margin smooth. On rocks, shady pools, lower intertidal and subtidal (to ? m), south and west coasts, locally common in areas affected by sand or silt. Guiry, M.D. (1977). 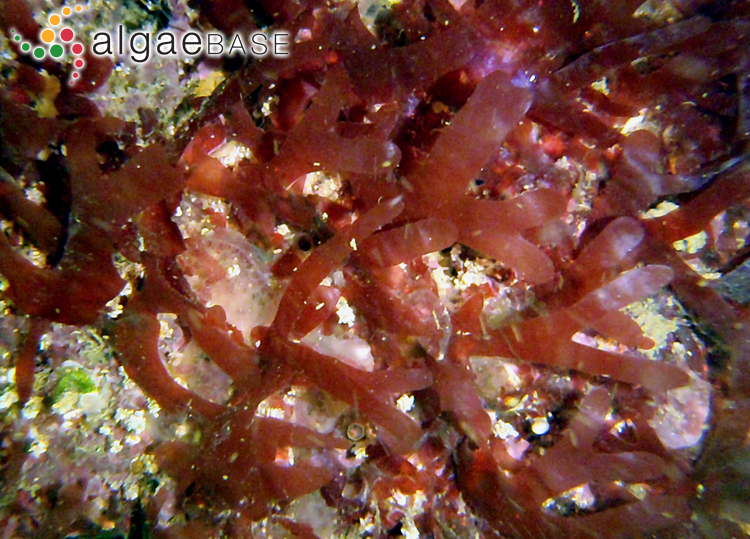 Studies on marine algae of the British Isles. 10. The genus Rhodymenia. British Phycological Journal 12: 385-425, 62 figs, 2 tables. Salhi, G., Hassoun, M., Moussa, H., Zbakh, H. & Riadi, H. (2016). 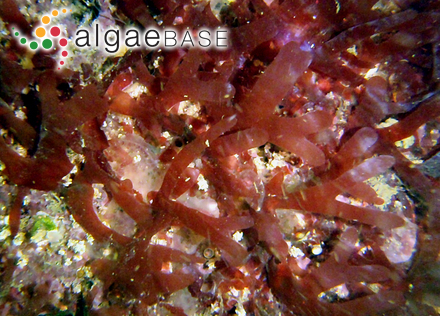 First record of Rhodymenia holmesii (Rhodymeniaceae, Rhodophyta) for the Mediterranean Sea from Morocco. 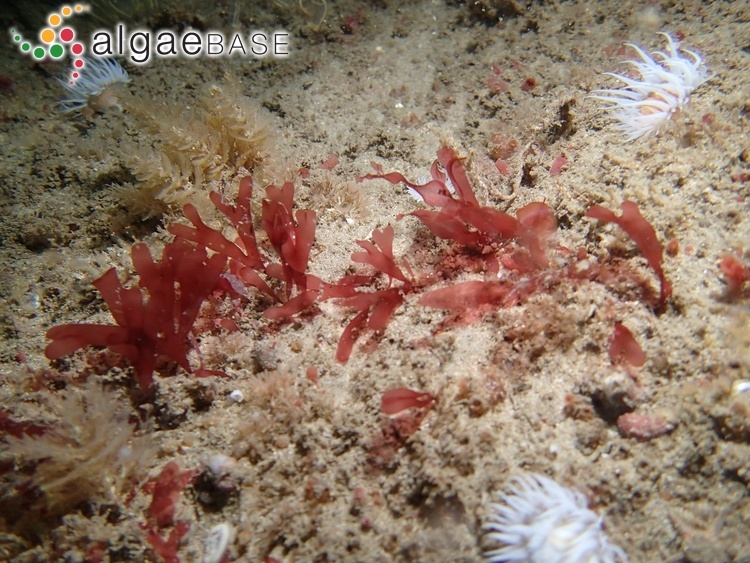 Marine Biodiversity Records 9(62): 1-6, 1 fig. Accesses: This record has been accessed by users 2859 times since it was created.